Homosalate is a widely used chemical in sunscreens and skin care products with SPF. Homosalate is a potential endocrine disruptor and studies in cells suggest it may impact hormones. In addition to direct health concerns following homosalate exposure, the chemical may also enhance the absorption of pesticides in the body. Endocrine Disruption: Homosalate impacts the body’s hormone systems, and in particular, the estrogen system. , In human breast cancer cells, which grow and multiply in response to estrogen, homosalate exposure led to 3.5 times more cell growth and multiplication. Some studies have identified the androgen and progesterone systems to be impacted by homosalate exposure. The androgen and progesterone hormone systems are also affected by homosalate., , , , ,  Although these findings have only been observed in cell cultures, caution should be exercised considering the role of these hormones in the regulation of development of reproductive organs. The endocrine disrupting effects of homosalate are particularly concerning since homosalate and other cosmetic UV filters have been identified in human breast milk samples, and the estrogenic activity of homosalate has been observed in human placental tissues. Gestation and infancy are both vulnerable periods of development when exposure to hormone-disrupting compounds can lead to adverse health effects. Breast milk contamination may be quite common. In one study of 54 mother-child pairs, 85.2% of the breast milk samples contained UV filters. The mother’s use of UV filter-containing products during pregnancy and/or lactation was significantly correlated with the presence of these compounds in the milk. VULNERABLE POPULATIONS: Pregnant/lactating women, nursing infants, agricultural workers, and people with habitual exposures to pesticides such as at parks or on lawns. HOW TO AVOID: Read labels and avoid products with Homosalate. 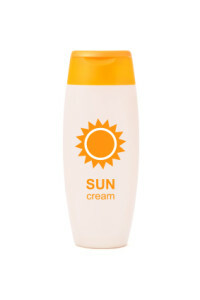 Choose cream or lotion-based sunscreens with zinc oxide or titanium dioxide. U.S. Department of Health & Human Services. Household Product Database. Available online: http://hpd.nlm.nih.gov/ August, 2014. Belsito D, et al., A toxicological and dermatologic assessment of salicylates when used as fragrance ingredients. Food and Chemical Toxicology, vol. 45, no. 1, pp s318-s361, 2007. Krause M et al., Sunscreens: are they beneficial for health? An overview of endocrine disrupting properties of UV-filters. International Journal of Andrology, vol. 35, no. 3, pp 424-436, 2012. Salvador A, Gadea I, Chisvert A, Pascual-Marti M. Supercritical fluid extraction and high performance liquid chromatography determination of homosalate in lipsticks. Chromatographia, vol. 54, no.11/12, pp 795-797, 2001. Available online: http://link.springer.com/article/10.1007%2FBF02492501#page-1. Sambandan D, Ratner D. Sunscreens: an overview and update. Journal of the American Academy of Dermatology, vol. 64, no. 4, pp 748-758, 2011. Miyamura Y, et al. The deceptive nature of UVA-tanning versus the modest protective effects of UVB-tanning on human skin. Pigment Cell Melanoma Res, vol. 24, no. 1, pp 136-137, 2011. Schreurs R, Lanser P, Seinen W, van der Burg R. Estrogenic activity of UV filters determined by an in vitro reporter gene assay and an in vivo transgenic zebrafish assay. Archives of Toxicology, vol. 76, no. 5-6, pp 257-261, 2002. Jiménez-Díaz I, et al. Simultaneous determination of the UV-filters benzyl salicylate, phenyl salicylate, octyl salicylate, homosalate, 3-(4-methylbenzylidene) camphor and 3-benzylidene camphor in human placental tissue by LC-MS/MS. Assessment of their in vitro endocrine activity. Journal of Chromatography B, vol. 936, pp 80-87, 2013. Ma R, Cotton B, Lichtensteiger W, Schlumpf M. UV filters with antagonistic action at androgen receptor in the MDA-kb2 cell transcriptional-activation assay. Toxicological Sciences, vol. 74, pp 43-50, 2003. Schreurs R, Sonneveld E, Jansen J, Seinen W, Burg B. Interaction of polycyclic musks and UV filters with the estrogen receptor (ER), androgen receptor (AR), and progesterone receptor (PR) in reporter gene bioassays. Toxicological Sciences, vol. 83, pp 264-272, 2005. Schlumpf M, et al. Exposure patterns of UV filters, fragrances, parabens, phthalates, organochlor pesticides, PBDEs, and PCBs in human milk: correlation of UV filters with use cosmetics. Chemosphere, vol. 81, pp 1171-1183, 2010. Chatelain E, Gabard B, Surber C. Skin penetration and sun protection factor of five UV filters: effect of the skin. Skin Pharmacology and Applied Skin Physiology, vol. 16, no. 1, pp 28-35, 2003. Sarveiya V, Risk S, Benson H. Liquid chromatographic assay for common sunscreen agents: application to in vivo assessment of skin penetration and systemic absorption in human volunteers. Journal of Chromatography, vol. 803, no. 2, pp 225-231, 2004. Kim T, et al. Percutaneous absorption, disposition, and exposure assessment of homosalate, a UV filtering agent in rats. Journal of Toxicology and Environmental Health, Part A, vol. 77, no.4, pp 202-213, 2014. Brand R, Pike J, Wilson R, Charron A. Sunscreens containing physical UV blockers can increase transdermal absorption of pesticides. Toxicology and Industrial Health, vol. 19, pp 9-16, 2003. Pont A, Charron A, Brand R. Active ingredients in sunscreens act as topical penetration enhancers for the herbicide 2,4-dichlorophenoxyacetic acid. Toxicology and Applied Pharmacology, vol. 195, pp 348-354, 2004.